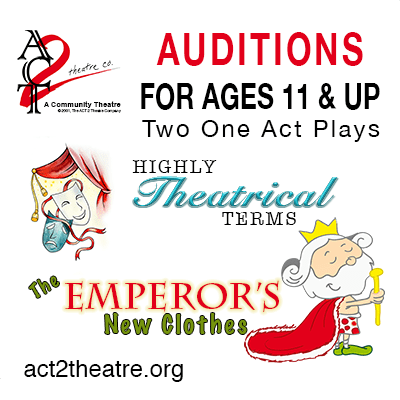 AUDITIONS for youth 11 and older are set in April for The ACT 2 Theatre Company’s June show, two one-act plays. The Directors: Cricket Hall and John Hall are co-directing this. or by private appointment, if you cannot make these times. In this comic retelling of the classic story, two con men escape jail, with bumbling detectives in hot pursuit. Soon they trick the vain, fashion-conscious Emperor into letting them create the royal garments for his daughter’s wedding. The garments, they say, will not only be of the highest possible style, they will have the magical property of being invisible to fools unworthy of their positions. What fun to watch fools prove they are not foolish in this land of super-charged pride and vanity. The Emperor’s New Clothes will be Produced by special arrangement with Brooklyn Publishers, LLC. This is a fast-paced performance piece for young actors. Taking on various characters in a series of scenelets and monologues, actors explore concepts and definitions in drama (hence, “Highly Theatrical Terms”). The result is an exercise in timing and pace that is both funny and audience pleasing. Highly Theatrical Terms will be Produced by special arrangement with Heuer Publishing LLC of Cedar Rapids, Iowa. The auditions will consist of cold readings from the scripts and improv games. If you are interested in seeing the sides ahead of time, please email Cricket at cricketzhall@gmail.com with Summer Youth Plays in the subject line. Thanks. If you are interested in working tech for the show we would love to have you please email John at JohnLHall1066@gmail.com with Summer Youth Plays in the subject line. Please don’t hesitate to contact us with any questions.